THIS ARTICLE WAS PUBLISHED IN SEPTEMBER 2012. System prices have since had to increase due to changes in exchange rates. Please visit our Sandwich Labelling page for more accurate pricing. Here at Positive ID Labels we are always thinking of fresh new ways to help those in need… of labels. We go out of our way to try and fulfil the wants and desires of our customers. Whether we are creating crazy shaped labels or colourful designs for their label guns, or even going out searching for endangered varieties of numbellers; we always have our customers at the forefront of our mind. Positive ID Labels are proud to offer a sandwich labelling starter package allowing companies to set up their own labelling suite from the comfort of their own building. I know what you are thinking, ‘Positive ID Labels are the greatest!’ But we are as modest as we are talented, and so we could not possibly comment. The sandwich label starter package that we offer includes a thermal printer, 3000 of our own “delicious” labels ready to be printed on and the necessary software that just makes the process as simple as shooting labels from a label gun. The package can also include on site installation AND training to help you produce labels to the sublime standard that all of us here at Positive I.D are so very proud of. It sounds too easy I know, but all of us at Positive ID Labels just like making people happy. If you are one of the potential customers I assume by now you will be salivating, ready to bite our hands off before we change our mind and withdraw our ludicrously kind offer. The one thing that would be required for this labelling dream to become a reality is a working computer. Without it we will struggle to design and print labels, and so our starter package would be no good at all. But have no fear we are here, and we have thought of that as well! 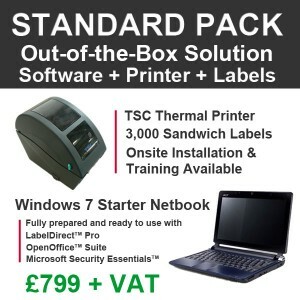 Positive ID Labels also offer a package that includes a brand new windows 7 computer, that is not only at a discount price, but already has the label creating programs installed on it.